Nokia has very quietly shuttered the social travel service Dopplr today, just over four years after acquiring it back in 2009. Nokia placed an announcement on the Dopplr homepage that says the service will be closed down as of November 1st. As of November 1st, 2013 we will be discontinuing the Dopplr service. What does this mean for you as a Dopplr user? You will continue to have access to your data until November 1st, 2013, after which the service no longer will be available.Nokia apologizes for any inconvenience, and we thank you for using Dopplr. 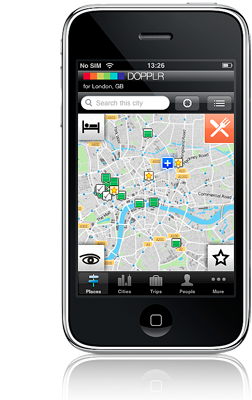 You may recall, or may not really, that Dopplr was a UK company that allowed you to open up travel plans to a close group of friends, letting you see people and events in the locations where you were going to be. An early location service along the lines of the Yahoo platform Fire Eagle (which was supported by Dopplr), and Dodgeball, much of the feature set has popped up in other services like Foursquare (the brainchild of Dodgeball founder Dennis Crowley) and Tripit, among others. It was acquired for around $15 million to $22 million by Nokia back in 2009, but the company never seemed to find a way to utilize the standalone Dopplr site properly. Since Dopplr’s appearance in 2007, location services have exploded and are now considered an integral part of every major mobile platform. Early services like Fire Eagle (also shuttered this year) and Dopplr were signals of the things to come.